As trucks delivered the latest edition of Sports Illustrated to Nashville, Tennessee, newsstands in 1974 — and as word spread about who was on the cover — the issue began to disappear just as quickly as it was displayed. 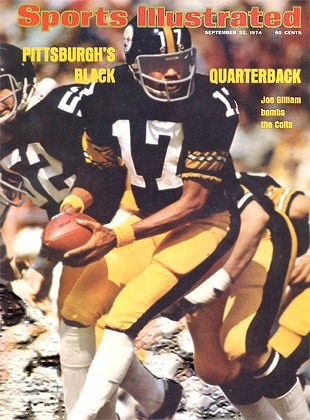 One could say that cover headline was a bit understated, as Gilliam represented more than Pittsburgh’s Black Quarterback. Gilliam was an 11th-round pick from Tennessee State, where he played under legendary coach John Merritt. Gilliam earned the Steelers’ 1974 starting position by beating out future Hall of Famer Terry Bradshaw. And Gilliam’s opening against the Baltimore Colts was historic: He was the first black quarterback to start an opening-day game in the NFL (James Harris started the opening day game in 1969 for the Buffalo Bills, but that was in the AFL). Gilliam had all the qualities to be a star. He was charismatic, he was fearless, and he possessed a cannon of an arm. Despite winning two Super Bowl rings, that never happened. Gilliam would play in just 20 games over four NFL seasons in Pittsburgh, making seven starts. He lost his starting job to Bradshaw despite going 4-1-1 in his first six games of a dysfunctional Pittsburgh season (coach Chuck Noll started three different quarterbacks that season) that somehow ended with the Steelers’ first Super Bowl title. Gilliam claimed he began using drugs after losing his starting position, and that substance abuse led to a downward spiral that featured multiple arrests and jail time. He had multiple opportunities (the New Orleans Saints signed Gilliam twice but cut him both times, and he played a couple of years in the USFL), but he never was able to return to the NFL. Yet, through all of those problems, it was clear that Gilliam was revered when more than 600 people showed up to pay respects to him after his Christmas Day 2000 death in Nashville from a cocaine overdose, just four days shy of his 50th birthday. “Joe made it all possible for every one of us black quarterbacks,” 1988 Super Bowl MVP Doug Williams said after the service. “The struggles he went through eased the struggles we had to endure. Gilliam comes from a family of football royalty. His uncle, Frank Gilliam, was an All-American at Iowa who became a longtime scout for the Minnesota Vikings after playing three seasons in the CFL. His father, the late Joe Gilliam Sr., was a coach at Jackson State and Kentucky State before arriving at Tennessee State in 1963. So Gilliam grew up around sports. He played little league baseball, did gymnastics and was a good swimmer. But football was his sport, and he stayed close to the game — and his dad — by serving as the team’s mascot when his father was at Jackson State. That’s how he met Gentry, who was the mascot at Tennessee State (then Tennessee A&I), where his dad coached. That friendship solidified years later when Gilliam’s dad took the job as defensive coordinator at Tennessee State. Gilliam became a fixture at practices and eventually learned the team’s offensive playbook before he even arrived at Nashville’s Pearl High School. If you lived in Nashville and encountered Gilliam during his high school years, there’s a chance you caught a pass from him. Tragedy hit the family in 1967 when Gilliam’s older sister, Sonia, committed suicide on the campus of Tennessee State, where she was a drum majorette. Gilliam was told after being pulled from a Pearl High School practice, and he disappeared from practice for a few days. After high school Gilliam attended Tennessee State on a football scholarship, and from the time he stepped into the starting lineup his junior season he led the team to a 22-1 record and consecutive wins in the Grantland Rice Bowl. Playing under a coach, Merritt, who bestowed legendary nicknames on players such as Ed “Too Tall” Jones and Joe “747” Adams, Gilliam was bestowed one of his own: Joe “Jefferson Street” Gilliam. During the 1972 draft, Gilliam was selected by the Pittsburgh Steelers in the 11th round with the 273rd pick overall. In an era where black college quarterbacks were often converted to other positions, the Steelers allowed Gilliam to stay true to his roots. Gilliam mostly sat behind Bradshaw that first year, playing briefly in two games. He made one start in five appearances his second season, completing 20 0f 60 passes for 331 yards with two touchdowns and four interceptions. The strike that opened the 1974 NFL season created an opportunity for Gilliam, who crossed the picket line and started all six exhibition games for the Steelers. When the season began, Gilliam was named the team’s starter for the season opener. Being the first black opening-day starter in the NFL was historic, but you would have never known it by asking the Pittsburgh players at the time. When Gilliam played, Pittsburgh’s offense was wide-open — a radical change for a team used to running the ball a lot with Harris and Rocky Bleier. The day the Steelers improved to 4-1-1 with a 20-16 win over the Cleveland Browns would be Gilliam’s last NFL start. He threw for just 78 yards, completing 5 of 18 passes. Gilliam claims the benching led him to drugs. He did earn two rings as the Steelers won back-to-back titles in 1974 and 1975, which was his last season. He had tryouts with the Saints and was cut twice. He was arrested multiple times on drug charges and played on several semipro teams and the USFL. In May 2000, Gentry had a scheduled work trip from Nashville to Louisville (where he was hosting a sports radio show on the grounds of the Kentucky Derby) and asked his best friend, Gilliam, to come along. Gilliam complained during the four-hour drive. But once they arrived at Churchill Downs and began broadcasting, Gilliam, the first guest, began to perk up. People recognized him and were eager to get close to him. A man who played just four seasons in the NFL was treated like a rock star. Pittsburgh fans attending the race on Millionaires Row noticed Gilliam walking on the concourse behind their seating area and pulled him up a 15-foot wall — and over a railing — so he could hang with them during the race. A government official from Louisville noticed him outside the Kentucky Derby Museum and invited him into an exclusive party. At the exclusive party, a woman who owned a great deal of real estate in Louisville invited Gilliam and Gentry to an after-party at her condo. As the two drove back to Nashville late that night, Gilliam leaned his head back in the passenger seat with tears rolling down his cheeks. Gentry, concerned about his friend, asked if he was OK.
As Gilliam’s tears flowed, Gentry became emotional himself. For the best friends, that would be their last extensive conversation. Less than a year before that trip to Louisville, Gilliam attended a ceremony celebrating the 25th anniversary of the 1974 Steelers Super Bowl team. Lewis, his wide receiver with the Steelers, wound up riding on the same van with Gilliam into the city. When Gilliam walked onto the field — wearing a Steelers jacket and a stylish hat, and looking fit — he was showered with love from the fans and his former teammates, all happy to see him doing well. Just over a year later, Gilliam was dead, with the listed cause (accidental cocaine overdose) coming as a shock to those who thought he had cleaned up his life. Gilliam’s funeral service was held at Tennessee State’s Kean Hall on what would have been his 50th birthday. His best friend, Gentry, helped organize the service. Survivors included three daughters (one of them, Joi Gilliam, is a rhythm and blues singer who was once a member of the group Lucy Pearl). 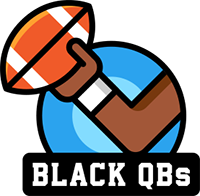 “It was sad because you looked around the room and saw all of these African-American quarterbacks that he helped open the doors for,” Gentry said. “Yet for all that he had gone through, through his professional years and through his life, to see him laying there unscarred and peaceful, it looked like he was sleeping. Just months before he died, Gilliam started the Joe Gilliam football camp at Tennessee State. More than 17 years later, that camp is still going strong. Which means that Gilliam’s legacy still lives. Gentry is reminded of his old friend almost daily. Open the door to Gentry’s upstairs “man cave” in his Nashville home, and the first thing you see? That 1974 Sports Illustrated cover of Gilliam.